Not only do we love to travel, we love to read about travel related things. When we read that Singapore’s Changi Airport was named “World’s Best Airport” for the seventh time in 2016, we were very curious what made this airport stand out from other airports in the world. We’ve spend a lot of time at airports. From very small ones like ‘Motu Mute airport’ (in Bora Bora) and Rotterdam airport, to very big ones like JFK, Heathrow and Dubai international airport. And to be honest there really wasn’t one that stood out. Our experiences with layovers are not the best. Most of the time, we got even more tired because there wasn’t a decent place we could sleep or relax and we got so bored when we saw the same shops over again and there was nothing else to do. Everyone with a long transit has felt this way at some point, right? So we reached out to Changi airport to try and discover what made this airport the best in the world! Important to every airport are the amenities. Waiting is a big part of every trip, so you will want to spend that time wisely. Whether you want to spend that time relaxing, working or shopping, the facilities at the airport have to make all of this possible for every type of traveler. Amenities in this category are perfect for the people who want to relax. 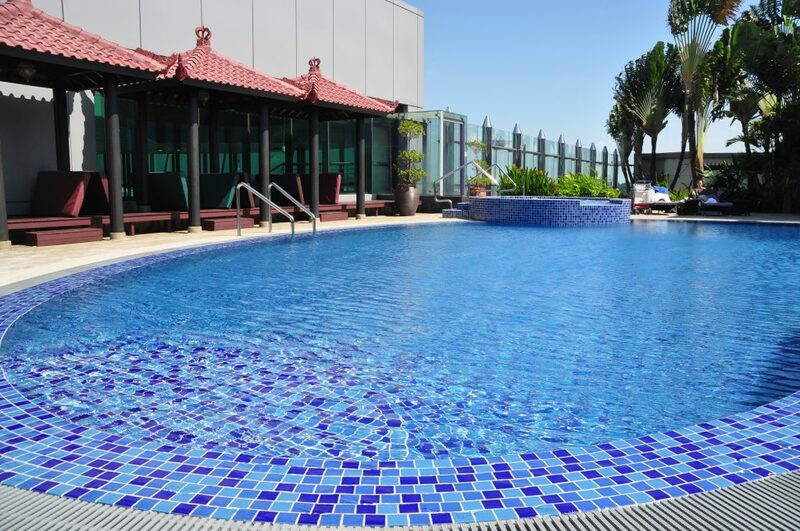 Terminal 1 offers a rooftop swimming pool overlooking the runway. That’s right, how awesome is that? Changi also has pay-per-use lounges for passenger who want to freshen up while on transit. These facilities are equipped with a gym and shower. Perfect when you’ve been sitting still for hours and want to get in some extra exercise! If you want to take it slow, you can also choose to have a full body massage, manicure/pedicure treatments or a haircut. In our opinion perfect when you rushed from work to the airport and didn’t have time to get ready for you vacation destination. We’ve been there too ;).And if travelling has been a little too much for you, you can always take a nap at any of Changi’s napping areas. They even have free foot massage machines available all across the terminals to soothe your tired feet. Pack your Suitcases tip: don’t forget to pack your swimsuit in your carry-on when you know you have a layover at Changi. And spend your time at home on other things, you can get your hair and nails done at Changi while you’re waiting for your connecting flight! When you have been sitting inside a plane for hours, it’s nice to be able to get some fresh air. 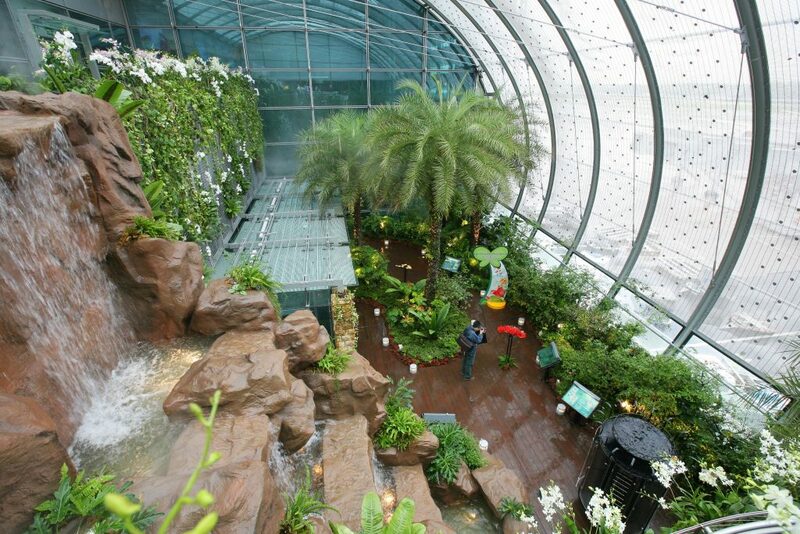 You can do this at one of Changi Airports’s indoor and outdoor gardens. There are five gardens with a different theme each. Terminal 1 has the Cactus Garden, terminal 2 has the Enchanted garden, Orchid garden (with 30 species of orchids) and the Sunflower garden (with about 500 sunflowers) and terminal 3 had the world’s first Butterfly garden in an airport (with more than 1000 butterflies). We bet that children will love to stretch their legs and look at the beauty in the gardens, bonus: they’ll probably learn something new too. Pack your Suitcases tip: If you’re at Changi between July and August, don’t forget to visit the Orchid garden in terminal 2 to see Singapore’s national flower the ‘Vanda Miss Joaquim’. We don’t have to tell you how important internet is today. Whether you’ll use the internet to Skype with your family back home to let them know you are safe, to book a hotel at your destination or even when you want to connect with your followers on Instagram like we do J, an airport can’t go without complimentary wifi. At Changi airport they understand the importance of wifi so not only do they offer it for free, they even have 550 free internet kiosks across all terminals that you can use. For those of you who need computer access, mail service of photocopying or faxing services, Changi provides round-the-clock business centers. And if the battery of your mobile device is getting low from all that surfing on the web, there are nearly 1600 USB ports and universal power sockets across the airport. Also free of charge!. Pack your suitcases tip: let Changi airport and us know what you are up to while waiting for your connecting flight. Are you visiting a garden? Or maybe swimming at the rooftop swimming pool? Upload a picture on Instagram and don’t forget to tag @changiairport and @packyoursuitcases. This is our favorite part! We have been waiting for a transit at the airport so many times, and usually we got incredibly bored. You can read a book and check Facebook so many times, but eventually you will want to do something else. Luckily Changi has some amazing amenities that will keep everyone entertained. 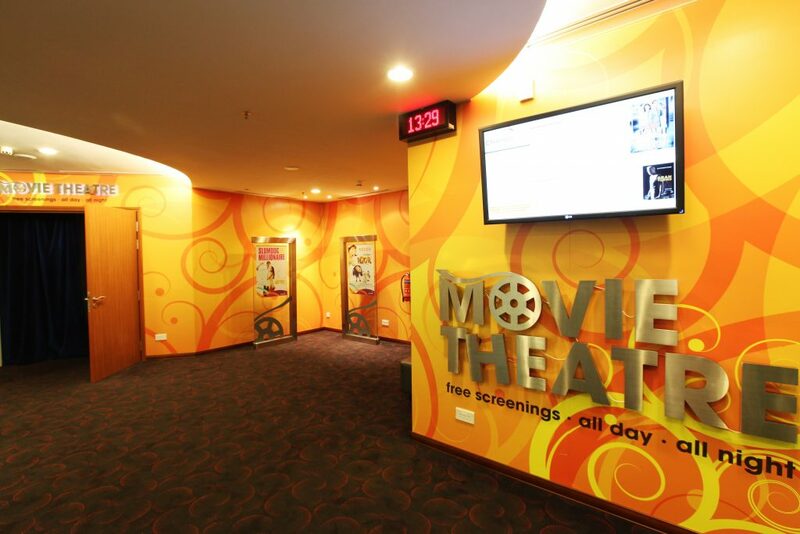 We were so excited to learn that Changi has a 24 hour movie theater. Ranald has been saying for years ‘why isn’t there a movie theatre at the airport, I’m stuck here for 6 hours, might as well watch a movie (or three)’. We think this is absolutely amazing and a very good asset at an airport. Further, there are LAN gaming stations and PlayStation/Xbox Kinect game consoles, perfect to keep children (and a few adults ;)) occupied for hours. But if you seek some more peace and quiet there are also cozy music corners and TV lounges. To sum it up: there is something for every age category! Besides having a movie theatre, there is another thing that Changi Airport provides that we find incredible awesome. A few years ago we went to the Maldives and had a 7 hour stop at a big airport. At first we were hesitant to take a trip with a 7 hour transit at an airport but when we heard which airport it was, we thought it wouldn’t be a big effort. Why? Because this airport in particular is said to be one of the biggest in the world, with the most amenities and that’s why they have their own TV show on the Discovery Channel (we’re not naming the airport, but we’re guessing that by now you know which airport we are talking about ;)). Anyway, our layover was disastrous. There free Wi-Fi wasn’t working, almost all the stores were closed, there weren’t enough seats or lounge chairs, to make a long story short: it was terrible and we were so bored. We wanted to go into the city and do some sightseeing but we were advised not to because transportation costs would be high and some of the sightseeing activities we wanted to do acquired you to book in advance. We were so disappointed that we were so close to a city we had never been to and had so much time on our hands but we couldn’t visit it. However, if you ever find yourself in this exact situation and you’re at Changi airport, you are very lucky! For passengers with a layover of more than 5 hours, Changi offers a FREE Singapore tour. You can even choose from 2 different tours, the Heritage tour and the City Sights tour. These 2,5 hour coach tours let you see some of Singapore’s highlights like Merlion and Gardens by the Bay. You can sign up at the registration booths located inside the transit area. We find this so incredibly cool! 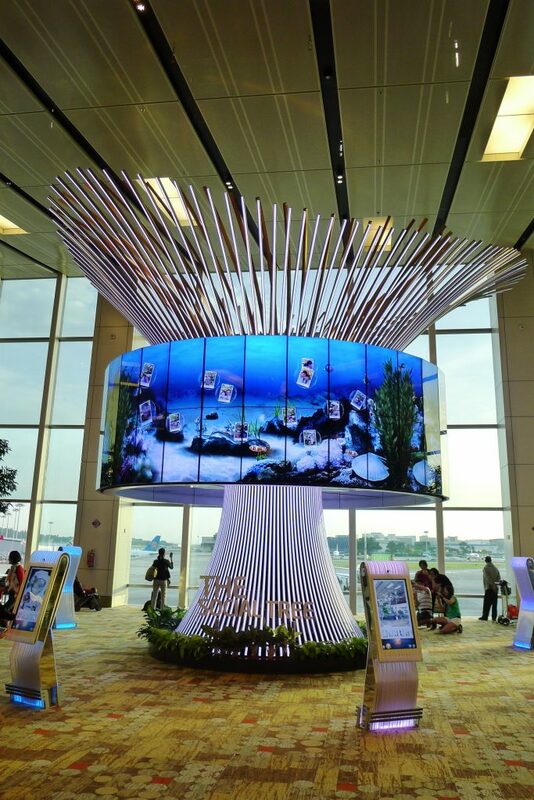 What an awesome way of Changi to promote Singapore and to keep their passengers entertained! If you want to go shopping, Changi airport has got you covered! There are over 350 retail stores. If you get hungry you can choose from a diverse range of international cuisines and dining concepts. 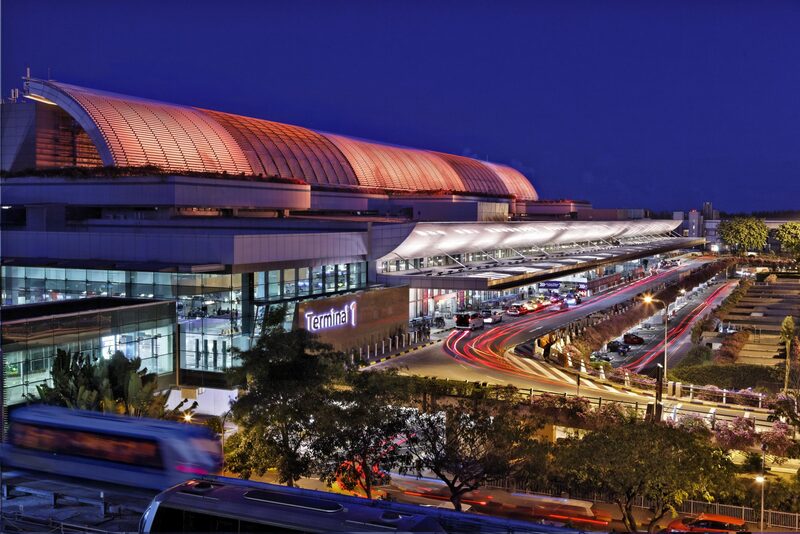 The airports offers more than 160 food and beverage outlets located across various terminals. 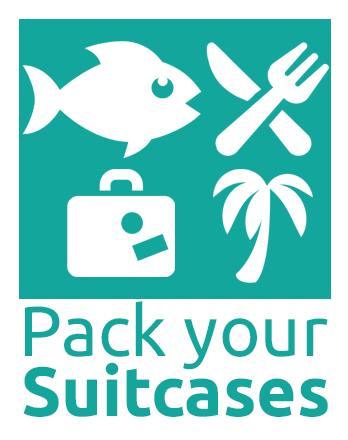 Pack your Suitcases tip: head to the nearest Shop@Changi kiosk as soon as you are at the airport. At the kiosk you can get a personalized itinerary generated for the duration of your stay at Changi. Your can choose which activities in the different categories (shopping, dining, entertainment, leisure) you would like to do, and a comprehensive guide will be created for you. Also, if you want to feast on some local favorites like Singapore’s famed Chicken rice of Nasi Lemak, the Singapore Food street in terminal 3 or the Straits food village in terminal 2 are a must visit! All terminals have a departure transit area. Here you can find the Ambassador Transit hotels. The hotels offer a wake-up call service, television and an en-suite bathroom. They even have sound proof rooms with a spectacular view of Changi’s runway. Be sure to book quickly as these rooms go fast! Changi airport has a lot of art spread throughout different terminals. 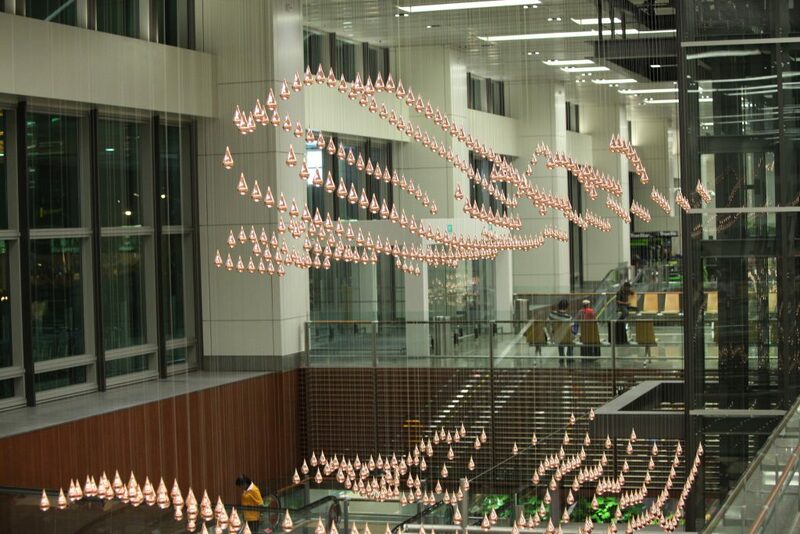 In the departure hall of terminal 1 you can find the ‘Kinetic Rain’. This art installation contains 1216 bronze droplets which can transform into different shapes and patterns like an airplane, hot air balloon and even a kite. 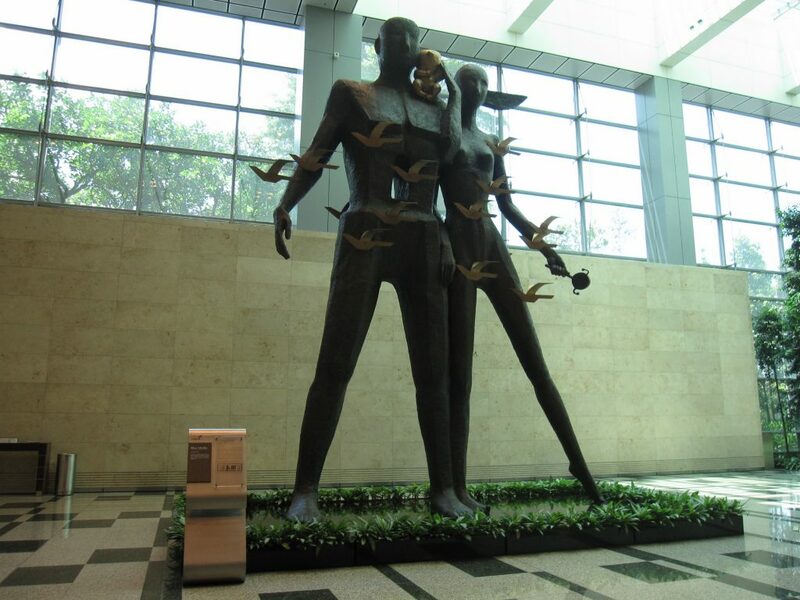 As passengers walk along the terminals they can see different pieces of sculptured art. For the art lover, there is enough to see at this airport! 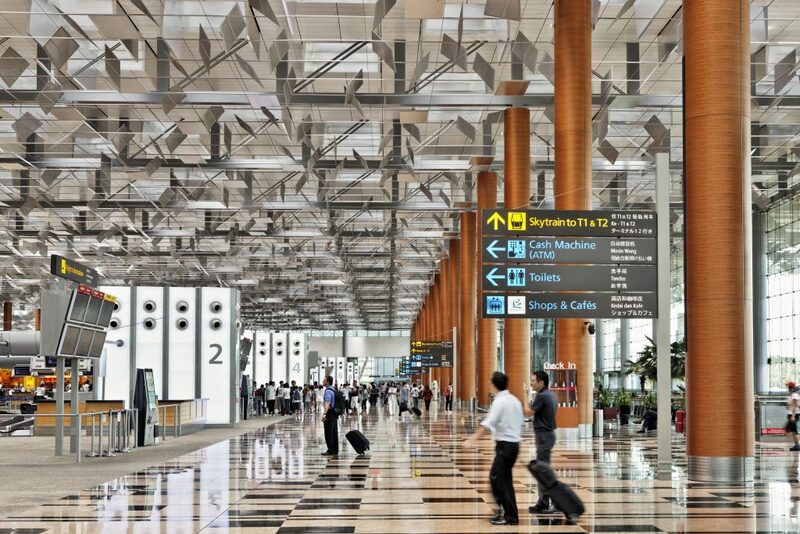 Now we understand why Changi airport has been named “World’s best airport” for seven times. We think that they did an amazing job trying to keep all passengers happy and entertained and we hope to experience it for ourselves someday soon! 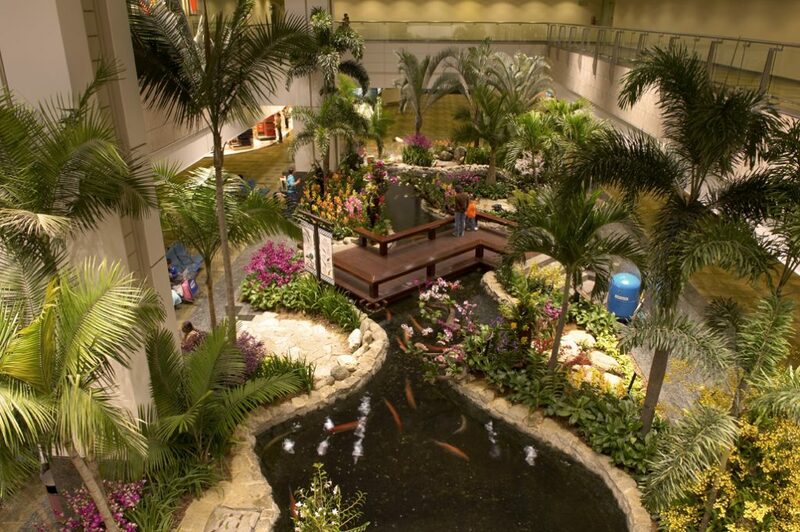 Have you ever been to Changi airport? And what do you like to do when you have a transit? We would love to hear what you think! I’ve been hearing a lot of praises about Singapore’s airport and it truly is a attraction itself. I seriously think that I can spend a whole day here without ever having to feel bored because there’s just so many things to do. I’d really love to see Singapore one day! Thanks for your comment. We hope to visit Singapore also.